Make Your Mum Feel Super Special on Mother's Day! It's Mother's day today and you still don't have the perfect gift to give to her. If you're struggling with common and mediocre gift ideas for her, just remind yourself why you are honoring your beloved mother on this day in the first place. She is the one person who has given you life and has loved you for who you are no matter what. She is the person who will accept you and teach you what is right and wrong. Most of all, she is the one person who won't ask anything in return for the love and care she has given you ever since you were born; therefore, you should make her feel just as loved by getting her a special and unique Mother's Day present for her. Does your mom like a particular artist? Is she always looking for a famous painting to hang on her bedroom wall? Well, if you can't get her the original artwork for her on Mother's Day, consider buying her a quality reproduction of the famous artwork instead. For example, if your mom loves a Caravaggio painting, you can have a reproduction made that looks exactly like the original. We at Direct Art Australia sell hundreds of famous reproductions that we know will make the perfect Mother's Day gift for her so visit the famous paintings section for possible options to choose from. If your mom is a simple kind of person who appreciates any kind of art, you can get her beautiful oil canvas paintings of all kinds for Mother's Day. You will find many paintings of different sizes, subjects, color combinations, all of which are made by expert professionals in the field of art. Hang these on her bedroom wall or living room as a Mother's Day surprise for her. But of course, everyone wants a unique gift on his or her special day so why not give your mother something original like a portrait from photo? If you have a photo of her that you know she loves and cherishes dearly, bring it to life and hang it on the wall for everyone to see by getting it painted on an art canvas. We handle portraits of all kinds and treat each one with utmost care, which is why most of the portraits from photos that we've done in the past have received great customer feedback. At Direct Art Australia, expect only the best of the best when it comes to art for sale. 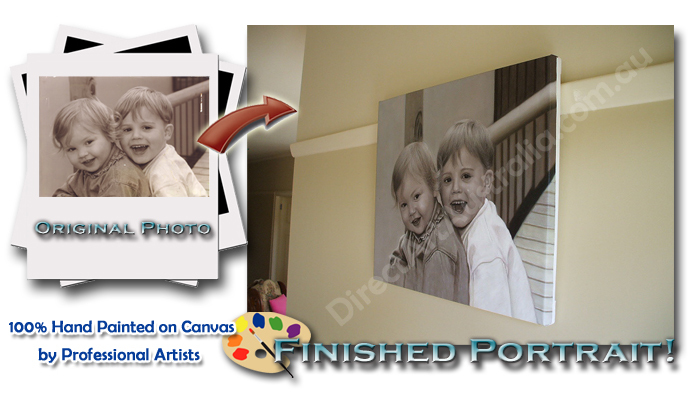 Buy regular oil canvas paintings or have a photo turned into a beautiful portrait for your mother on Mother's Day. These are just some of the possible gift ideas to give to her so make sure to browse around the shop for more choices. If you live anywhere in Australia such as Melbourne, Sydney, Brisbane, Perth, and Adelaide, consider your shipping free of charge!